I spent some time earlier this afternoon sorting out my camping gear on the back lawn. 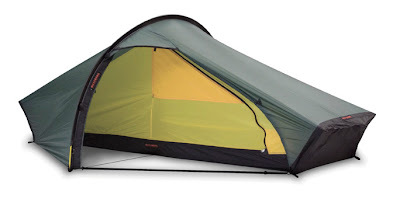 The tent I have now is a 2-person tent - fairly large, and it probably weighs (with poles) about 8 pounds. If I am to portage the route in a single go, I will need to tie the tent to the bottom of my backpack. I'd really like to reduce this weight by spending a mere $365 on a Hilleberg Akto. This is a 3lb tent. It must have very little human traffic. It must be a reasonable distance from Toronto. It must be easy enough to reach by a beagle who has had knee surgery on both hind legs. To fulfill these requirements I read about all sorts of loops and locations in the park. I located information about a lake called Pinetree Lake. There are several aspects about this destination that fulfill requirement #1 - little human traffic: It is difficult to locate the access point - the small parking lot is hard to find from the highway, the sign that indicates the start of the portage is about a 50 meter hike in from where you leave the car. You have to portage just to get to the lake - this discourages a significant amount of people. The paddle is fairly long - but not all that tricky. Requirement #2 - must be a reasonable distance from Toronto. It isn't far at all - maybe 3 or 4 hours. It is only a few kilometers along Highway 60 past the normal turn off for Rock Lake, Lake Louisa etc... And instead of having to drive down 8 kilometers of gravel and dirt road, it is a quick turn off from the asphalt highway to get to the parking lot. Finally - regarding requirement #3 that the trip not be hard on Monty's little knees - from the accounts that I have read, the portage is fairly easy and straight-forward. There is only the single portage and then a canoe trip. He doesn't use his hind legs to use his paddle, after all.